First, can you tell us a little about yourself? What can you tell us about Draco Magi? Draco Magi is a strategic and thematic card game where you play a Dragon mage apprentice vying for the throne of the dragon king. You do this by commanding dragons into battle on different landscapes to win gems. It’s a contest to become the head honcho. Robert Burke Games is an “indie game publisher,” but you have some pretty heavy hitters who have contributed to Draco Magi. How did you get so well connected in the industry, and how did you manage to assemble this cast of characters to help develop the game? Well I guess it boils down to two things. The first was putting out some games that were recognized--namely, Cartoona and Battle For Souls. And the second is, I was lucky enough to meet some great people in the industry, whom I meshed very well with. I value the friendships I’ve made since I’ve entered the fray more than anything else. You and Richard Launius co-designed Draco Magi; where did the concept of the game come from? And can you share a little about the design process? 1. Draco Magi started as an abstract strategy game that was in my head for some time. It was just cards of numbers and colors. So the rest is history. We think we have an excellent 30-minute game that is highly strategic and thematic, has world class art, and that we can sell on Kickstarter for $15. We hope this is the right combination for success. The design process was fantastic mainly because we had two different perspectives and play testing groups helping to develop the game. The collaboration really forced us to look hard at every change since there was always another designer to review it, critique it, and streamline it. 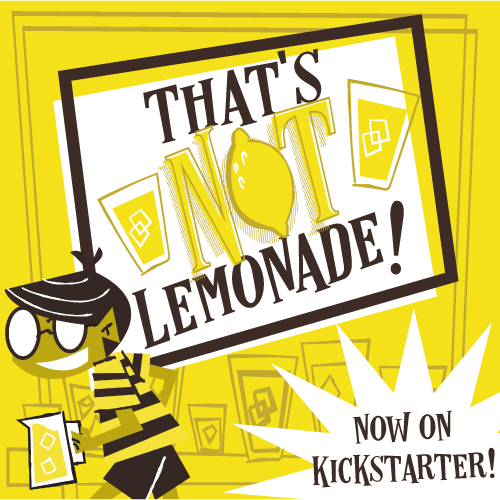 You’re no stranger to Kickstarter, and the process of getting a game from idea to market. What is the most crucial piece of advice you would give an aspiring designer/developer before they jump into a Kickstarter campaign? Get the word out from day one. Show people your design process publicly. You can’t be fearful of people stealing your idea. That won’t happen! Show them your art as you find it. Be transparent about what the game is. Make as much media available as possible: review copies, art, rules, videos, podcasts, etc. If you wait until your Kickstarter begins to do this you’ll have a difficult road indeed. We know you’re neck-deep in the Draco Magi campaign, but is there anything on the horizon you can tell us about? Yes, I am working with Steve Avery on a dungeon-delving card game with a traitor mechanic called Doppelganger. You have to complete quests as a team, but one player is a doppelganger trying to kill a party member off. And another is a still-untitled, bluffing game. It was inspired by Coup, a game I love, but that I have some issues with. Namely, the limited number of roles and the player elimination. For this one I am focusing on removing player elimination and will have a lot more roles. Money is the key to victory in this. It should end up being small and inexpensive, but pack a lot of interactive punch. You’re a self-described “music freak.” What does that mean, exactly, and what are five bands that we might not have heard of that we should be listening to? I love and play music, and I write playlists for Yahoo Music and the brand new Beats Music. Here’s a link to my top 100 albums of last year. Okay, it’s time for the Rapid-Fire Section! We ask the questions; you answer them with one word (or super-short phrase)! And, GO! Favorite dragon in Draco Magi? Favorite Kickstarter Game You’ve Backed? We'd like to thank Robert for spending some time with us today! We've reviewed Draco Magi and you can find that review right here, and you can still get in on the Kickstarter campaign of the game for a meager $15 until Feb. 21, 2014 by clicking right here! Thanks for reading! If you enjoy TOG, we'd love it if you subscribed to the blog over on the right, and if you liked/shared us on Facebook, followed/tagged us on Twitter and Instagram, Subscribed/commented/shared our YouTube Channel, and subscribed/shared/reviewed our Podcast on iTunes! Well another week has completely sped by here at TOG--and what a week it's been! Podcasts...reviews...all kinds of stuff. Today as we finish up the week we once again bring you our old faithful Kickstarter Weekly piece, to help you navigate through the countless campaigns competing for your gaming dollar. Let's dive in! Well, we just published our review of Draco Magi yesterday, and since then they've unlocked their first stretch goal... Coincidence? Probably. Regardless this campaign is already a juggernaut, with lots of stretch goals that everyone will get to enjoy, but if you back the campaign you'll get to enjoy them for $10 less than folks who wait until it hits retailers. The campaign ends on Feb. 21 and it's a mere $15 to get Draco Magi shipped to your door! The full campaign, stretch goals and details can be found right here! Four Tribes is a light strategic card game of influence and area control. It's driven mostly by cards, with some extra wooden bits thrown in. The buzz around this game is pretty positive and they've already funded and unlocked some stretch goals. There's just a few days left to get in on this one--it ends on Feb. 6. A pledge of $30 will get you a copy of the game, and there are also some deals to be had with other titles as add-ons. You can find all the details of the campaign right here! Well, wouldn't you know it, another Pirate Game made it to Kickstarter Weekly. Queen Games, who brought us the Spiel Des Jahres winner Kingdom Builder in 2012, is Kickstarting Tortuga, a transport-and-plunder dice-roller for both young and old gamers. Or so they say. The images on the campaign page show a great, bright and colorful game with lots of custom bits & dice, player screens & boards. They've funded and unlocked all but one stretch goal already, so if you want to grab a copy, it's time to jump on board! Ends Feb. 13 a few $41 level pledges left for the full game and stretch goals; then it goes up to $50. Find out all the details right here! The internet has--inexplicably--generated an obsession with kittens doing things. I (Jeremiah) seriously don't get it. (Firestone doesn't get it either!) Nor am I very often entertained by this phenomena. But for those of you out there who find no end to the amusement afforded you by... cats. This one is for you. Kombat Kittens: The Card Game, is... a card game. Featuring artwork that is half kitten half drawn in battle gear. And then you make them battle and stuff. The Campaign video epitomizes the underbelly of the internet's cat "thing". The campaign ends Feb. 20. And you'll cough up $25 for a copy. Find all of the "adorable" details right here. Just a few quick reminders of some campaign we think you'll be sorry if you missed out on! Another spin on Werewolf that touts gameplay for up to 75--that's seven-five--players! This campaign is making its final push and ends Monday Feb. 3. $25 Click here for the details! Come on! This is a great game that you can pick up inexpensively. We're not sure why Zeppeldrome isn't getting the love on Kickstarter we think it so deserveredly deserves! Click the link for all the details on this fun game that is great for players of any age and skill level! This campaign ends Feb. 16. $29 for a copy of the game! HERE is where the details are! Thanks for reading TOG, let us know what you're backing or if there's something awesome out there we missed this week! In the meantime our contest for a free copy of Relic Expedition is still going! Just follow, like or subscribe your way into the contest by clicking one or all of the following: Facebook, Twitter, Instagram, YouTube, or typing your email in the box over on the right! Thanks for reading, and play some games this weekend!